The TD-EcoWatt range of mixed-flow fans incorporates the latest innovative EC motor technology. Suitable for mounting in any position, the range is available to suit standard duct sizes from 100 to 315mm diameter. Ideal for the ventilation of toilets, laundries, ensuites and kitchens for homes, hotels and commercial premises. An energy efficient solution with state of the art EC motor technology. Speed-controllable from 10% to 100% via a 0-10V analogue input signal. Fans can be removed for maintenance or repair without disturbing the duct system via specially designed support brackets. 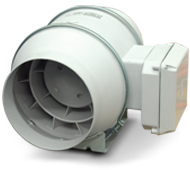 All models are designed for direct connection to standard diameter circular ducting. Integral mounting foot makes installation more simple. Includes plug and lead for easy and quick installation.